Ok, I'm getting ahead of myself. Hopefully you've seen dippin' dots before, the flash frozen little tiny balls of ice cream. We use to have a dippin' dots machine at the mall, not sure if it's still there though. 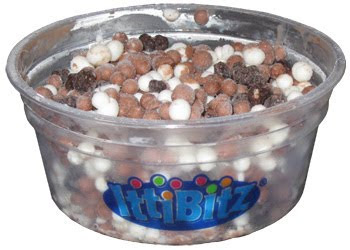 There appear to be at least 16 flavors of Itti Bitz, though usually I only see 4-6 flavors at the store. I've been meaning to try them for awhile, and finally an orange labeled container named Waffle Cone Twist was what won me over. I love waffle cone bits, I just can't get enough of them. I couldn't wait any longer and so I dug in ...and quickly became very disappointed. It tastes like a Jell-o pudding pop from oh so long ago. Sure, they are cold ...real cold, great way to find out if you have any cavities or any other loose dental work, but so what? It's just not a pleasant way to eat ice cream. it's gimmicky and nothing else. It's not smooth, it's not creamy ...and it kinda left a weird taste in my mouth. My tongue wasn't so frozen as too numb my tastes buds either, and technically, that may have been preferable. Ok, that wasn't nice, these aren't awful, but don't expect me to review any of their other flavors any time soon. Parting thoughts: the nutritional stats don't win over any friends either. Sure a serving of Ben & Jerry's is half your fat for the day, but it's rich, smooth, creamy, and most likely delicious. This is not. Ben & Jerry's is also all natural....unlike the sucralose inside the Itti Bitz. Yeah, I'm good for awhile, thanks. One more shot: For a super frozen treat, they sure melted on my counter awful fast. I had the cotton candy flavor today - and it was absolutely disgusting! It felt awkward in my mouth, and the after taste was atrocious. After having let it sink in for a couple minutes, I have to embarrassingly admit that I feel like I need to puke. Rip off brands for anything are never particularly too bad (they are still bad, but not as bad as some claim), but I'd pay an extra dollar for the real dippin dots over whatever this is any day! Oh geez, did you buy it because it was on sale? I just picked up the cotton candy flavor because it was a dollar and I thought "I havent tried this in forever, maybe it's not as bad as I remember"